The Beach Guild of Fine Art is celebrating 20 years this fall with a new location for its annual fall show. Jennifer Cline, one of seven founding members of the Guild, will miss the waterfront location of the Beaches Lions’ clubhouse, where the group of 55 artists has held previous shows. However, the beautifully renovated Beach United Church should prove an ideal replacement, with the combination of the enhanced building and its location on Wineva Avenue just north of Queen Street East. Cline said she’s looking forward to discovering the advantages of the new venue, including its location in the heart of a creative – and creativity-loving – neighbourhood. “The Beach is a great community for art and artists,” she said. Cline originally trained at the Ontario College of Art, on a full scholarship offered by the Eagle Pencil Company. She spent most of her career working as a commercial artist, for companies including the Cockfield Brown Agency, Eaton’s and The Bay. In the 1980s she rekindled her love of watercolour painting and has been producing fine art ever since. 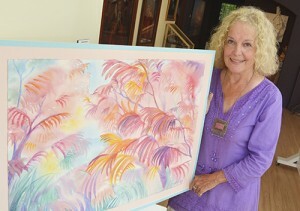 Cline, who paints mainly in watercolour and sometimes acrylic, grew up in Scarborough, but moved to the Beach in 1976. She paints local scenes, sketching or painting on site, as well as occasional work based on historic photographs. Her work has been commissioned by organizations such as Community Centre 55 and the Balmy Beach Club, is featured on the Beach BIA’s light post banners, can be seen on posters and greeting cards available in a number of Queen Street shops, and has been featured in a number of gallery and outdoor art shows. She takes part in Guild shows, and was part of the Beach Studio Tour for 15 years as well. While that might seem like a lot of art to produce, Cline said she never ceases to be inspired by her surroundings. She’s painted around Toronto, as well as in Greece, England, Colombia and France. Despite her travels, she keeps coming back to her favourite subject, the Beach. Art in the Beach (formerly called Art Down By the Bay) takes place at Beach United Church on Saturday and Sunday, Sept. 20 and 21, from 10 a.m. to 5 p.m. An opening reception will be held from 6 to 9 p.m. on Friday, Sept. 19. The free show features work from more than 40 of the Guild’s 55 members. A boutique section will feature cards, prints and originals under $150.